hanny.only: ELF "FOR THE PARTY" Eyeshadow Palette Swatches!!! ELF "FOR THE PARTY" Eyeshadow Palette Swatches!!! So excited, coz today i finally get my hands on this wonderful eyeshadow palette from ELF called For The Party.. well, people, it's definitely use for the party.. check out the pictures below..
First and second row is representing more to the natural eye look.. earthy tone.. it never goes wrong in any situation and blends well in any outfit.. so it's a save way to go when you're stuck actually.. haha..
Ha! This what i meant by Wedding-Soft theme.. you can totally rock the bridal makeup with this.. such a very soft and feminine colors, rite?? Awww.. cute.. reminds me of flower fields.. The 4th row still has the soft nuance.. but already got the darker dramatic color.. more like a transition.. from here, things are gonna get more interesting.. from formal to runway-rock'n'roll, baby!! Woohooooo.. (that's my insanity talking, sorry!!).. Those greens are driving me even more crazy.. look how gorgeous they are.. the gradations are perfect, so blending would be easy peasy..
Now the 6th and 7th row completes my urges with a blast of blues.. ohh man, like heart attack is in a glimpse of an eye.. i almost bursts in tears.. too happy!! Can not stand any longerrrr.. huaaaaa!!! Last but not the least, of course, the touch of luxury black'n'white.. with gorgeous pearly white, silver and matte & pearly blacks, it totally sets the product to perfection.. i am a person with unexplainable addiction towards black eyeshadow.. i put 'em in each of my eye makeups, in whichever color i tend to use.. for me, black is important to give a statement into smokey eyes look.. ahhhh perfecto!!! gosh.. this palette is a smart choice.. with reasonable price and very compact for fulfilling your creativity.. for the pigmentation, i love the shimmery ones.. pigmented and easy to blend, that would be my first impression when i tried 'em for the very first time.. however, the matte one acts like any other matte eye shadows.. it's harder to blend but still understandable..
so overall, this product is a MUST HAVE for you makeup junkies... esp for teenagers or beginners who just started to get interested in makeup world and wanna have an eyeshadow palette.. lol..
@TurisCantik coba cek ke sponsor ku.. mungkin dia ada ready nyaaa harga ol shop ini lbh murah loh.. aduu ga rugi bgt punya iniii.. hihi..
@Nita iya donk nittt.. kecil2 doi da narsis.. hihi..
@Mizu where do you live?? 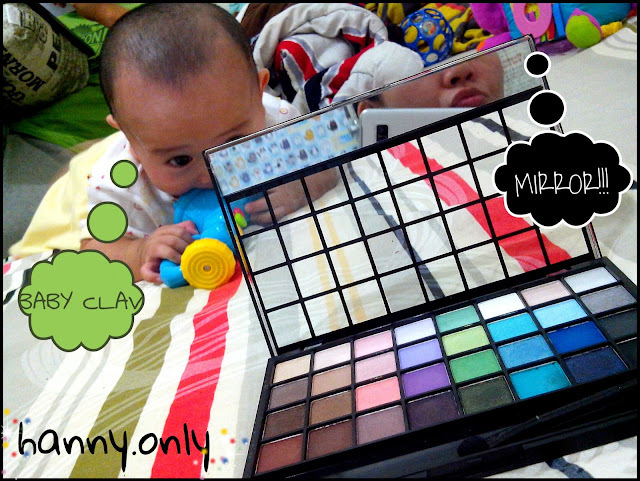 i have to order all my elf's product online too.. ^^ it's an amazing palette.. i love it..